I'm still not sure about Brad Mehldau. 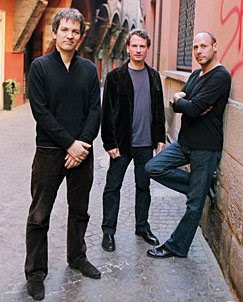 Courtesy of the 'Write Stuff' scheme I got another chance to see the Brad Mehldau Trio at the Barbican in London on Monday the 20th Oct. I saw this same trio with Larry Grenadier on bass and Jeff Ballard on drums at the RNCM about a year ago and I preferred this one for sure. Brad cuts a graceful figure, politely bowing his head to receive applause with his trademark self-assured calmness. The trio hit an easy feel straight from the off with a delicate groove on the first track, 'Dream Sketch'. A early highlight was the jammed ending to the latin 'Samba Amour'. It's straight and simple chord voicings outlined an enticing seventies style repeating sequence that left plenty of harmonic space for some really expressive improvising from all the players. My main problem with Brad's playing generally is that it can be overly dense, both harmonically and rhythmically, often leaving little room for anything else. This problem was in evidence tonight, but about half the material worked well for me. A definate plus point is his penchant for interpreting tunes from well outside the jazz sphere. A version of Sufjan Stevens' 'Holland' was another high point from a generally mixed affair. Well I missed out on the MCR Blog Awards this year, but this has been made up for by successfully winning a place on the 'Write Stuff', an initiative between the London Jazz Festival, Serious music producers, BBC Radio 3 and Jazzwise magazine. The scheme "aims to give aspiring music writers the opportunity to work with professional journalists to improve their writing skills, receive insights into career paths and develop an understanding of jazz criticism". It looks like it will be really useful to someone such as myself. So I went down to the Barbican a few days ago for the initial meet and greet session with Cameron Reynolds from Serious, writer and broadcaster Kevin LeGendre and the other seven students. We all got on really well from the off and it looks like it's going to be a great experience. Afterwards we were given our first journo perk of a guest spot for the Brad Mehldau gig straight after. We'll also get to see and review gigs during the London Jazz Festival, so I hope manc jazzers won't be offended by my widening of the ring modulator frequency range for that week. It's all in a good cause.